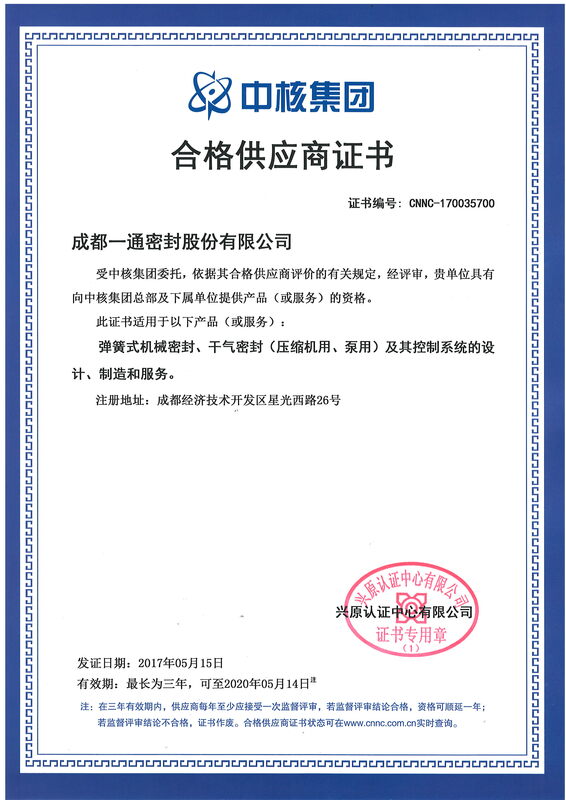 In the nuclear group to entrust a third party audit institutions - xing original certification center, according to the relevant provisions of the qualified supplier evaluation, on the ground to chengdu on the seal co., LTD., for data collection and review, evaluate whether our company has to provide nuclear group headquarters and subordinate units in a product or service, based on my company's qualification, quality management system, technical ability, production capacity, process control, quality assurance ability and the ability of the business review. Through team conducted a process-based strictly, real, detailed review, my company is good, the indicators conform to the requirements of the nuclear group of qualified supplier qualification, our work also got great team conducted a process-based affirmation. After the nuclear group of multiple audit, finally passed the assessment ? 上一页： "Gas pipeline compressor dry gas seal 15 mpa"